Thomas Noah has had his dream job for over 20 years already—working in the Spreewald National Biosphere Reserve, which covers 470 km sq in the riverine wetland where he grew up. His duties as Park Ranger include visitor education, scientific surveys and habitat management. When the former East Germany opened up, with his newly-issued passport in hand, Tom’s first destination was Hong Kong to see the spoon-billed sandpiper and great knot. 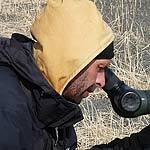 2012 was his 7th expedition to the Russian Far East to survey for spoon-billed sandpipers and migrant waders. He is head of the German Spoon-billed Sandpiper Support Team.